Good Natured Map of 1936 Shrine Playground. 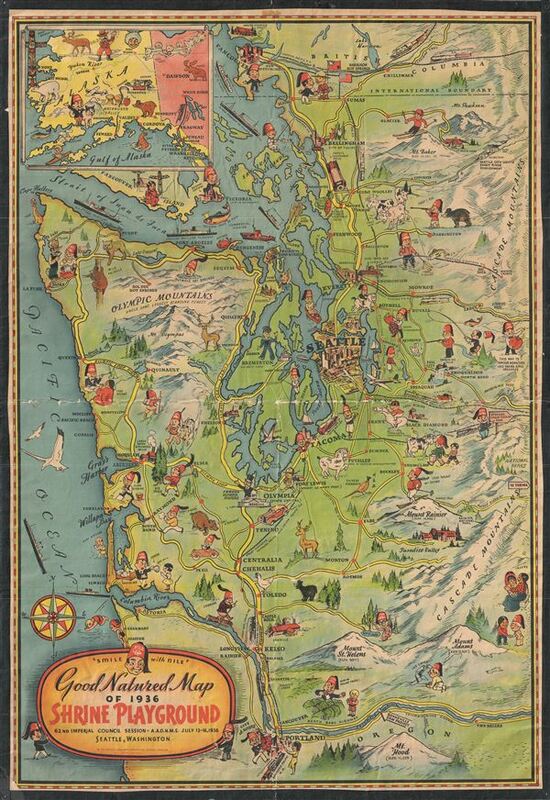 This is a beautiful example of the vibrantly colored 1936 pictorial Shriners map of the Pacific Northwest. This map was created to commemorate the 62nd Imperial Council Session of the A.A.O.N.M.S. (Ancient Arabic Order of the Nobles of the Mystic Shrine) held in Seattle, Washington from July 13-16, 1936. Centered on Seattle, the map covers western Washington states and parts of adjacent Oregon and British Columbia. The upper left corner features an inset map of Alaska. Throughout the map features the 'Smile with Nile' Shriners character wearing his trademark red fez while performing various acts, including smoking a pipe with native Americans, chopping trees, skiing, fishing, hunting, etc. Other pictorial elements identify various landmarks and cities, mountains, major roads, animals, and ships. The map is dated and copyrighted 1936 and printed by the Farwest Lithograph and Printing Co. Quite scarce. Good. Some wear on old centerfold. Backed on black linen. Blank on verso.